Her career prospects became clearer when she went to Minneapolis, where she began to sing in the dining room of the Radisson Hotel. At the same singer Peggy Lives, she managed, as they say, to “light up” in one of the radio shows, and join the Seva Olsen group. But three months later, Peggy Lee threw everything and went to California, taking on the road $ 18 and a father’s ticket. There she managed to get an engagement in the Jade Room in a restaurant on Hollywood Boulevard. But Peggy did not make much of an impression on the movie capital, and she was lowered to the work of a waitress. Unfortunately, the sea air is not very beneficial effect on the health of the future celebrity. Peggy more and more worried angina. Her health deteriorated, and one night she almost suffocated. The operation followed the operation. And so it went on for two and a half months. No one at that time could have imagined how successful the treatment would be. They gave Peggy Lee a completely new voice – deep and hoarse. Peggy was simply amazed by the so-called “acquisition.” It was this that helped her find the job she had dreamed of. The next step was the chic Chicago Ambassador West Hotel. It was here that Benny Goodman noticed her, who was just looking for a replacement for his vocalist Helen Forrest. So Peggy got a job. At the same time, it was a bit scary and alarming for the singer – at 21, even her most ambitious wishes came true. She could not even imagine such a thing, because just recently Peggy milked cows, she worked at a bakery, and now she has New York and her first performance with Benny Goodman. But then something unimaginable happened: at the premiere concert her voice seemed to freeze, she sang like a mechanical doll. That evening, the critics had something to live with. They instigated her complete defeat, and other members of the orchestra urged Goodman to part with such a worthless vocalist. But Benny was not one of those who are afraid of the first impression, and then he was not mistaken. 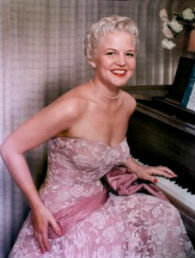 A few days later Peggy Lee showed what she was capable of; singer Peggy Leah was instantly turned into admirers by critics. They then wrote that Peggy looked like something icy. Her skin is like a petal of gardenia, deep blue eyes and white-gold hair. And she sings like a slowly exploding firework. In her performance, Peggy joined two singers whom she particularly admired – Billie Holiday and Maxine Sullivan. In July 1942, Peggy Lee recorded the first hit, “Why Don’t You Do Right?”. The disc sold over a million copies and brought the singer unprecedented popularity. There were two reasons for the lull in Peggy’s career. This is the marriage with guitarist Dave Barbour in 1944, the singer Peggy Leah, the birth of their daughter Nika. Peggy’s music pleased her home life. She flourished as a wife and mother, and looked at the past without regret. Then they lived on the West Coast. At this time, the couple composed a few songs that in an instant became popular. In addition, she was seriously interested in lyrics, music for films and other creative activities. A pianist and accompanist of both Peggy Lee and Ella Fitzgerald, Jimmy Rawls defined the singer’s talent in this way: “Peggy Lee lives in music.